A smart device or laptop monitors your baby and transmits audio and video via Wi-Fi or cellular connection to the Parent Station. Let you see live video and hear your baby on your smart device or laptop in real time and enables you to soothe your child remotely. When you purchase the Baby Monitor 3G, you will be given a 9 digit code. Simply enter the 9 digit number on both the parent and baby stations and you’re good to go. No user accounts or complicated network settings are required. Baby Monitor 3G just works. Baby Monitor 3G transfers high quality live video from the child´s room to you over both Wi-Fi and cellular connections. To save data, you can switch from video to still photos whenever you need to. Baby Monitor 3G supports both Wi-Fi and cellular 3G/LTE networks, giving you baby monitoring capabilities with reach that is unaffected by distance. You can monitor you child from any location without worrying about a weak Wi-Fi or cell signal. You can soothe your baby to sleep by playing them some calming music. Lullabies can be imported from music library or Baby Dreambox app. Android devices only work as a Parent Station. Microphone sensitivity settings are controlled by you so that you can clearly hear all sounds in your child’s room. Simply press a button and speak. Your child will only be one tap away from your voice. Feel secure knowing that you can hear and communicate with your child from any location. The Smart Night Light has adjustable intensity, making it possible to see your baby, even in low or no light. Make Baby Monitor 3G truly yours. You can set it up with your baby’s name, tell the app the baby’s gender, and the display icon will show a baby boy or girl with your child’s name. Reliability and privacy are our biggest concerns. The app tracks the battery level of the baby station and reports low battery status to you. The stability of internet connection is carefully monitored. Are you not sure what the little sound you barely hear is? Sensitize the sound for a moment so you can hear every tiny sound from your baby’s room. 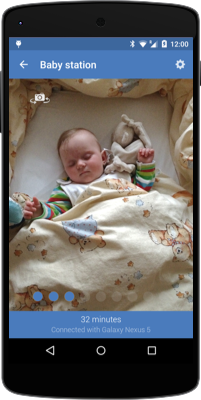 Adjust the app to make it easier to check your baby’s activities during the night with your phone on your nightstand.